A prepubescent girl named Mary Smith moves out to the English countryside into her great aunt Charlotte’s home, Red Manor, during the holidays ahead of her parent’s arrival. There isn’t a great deal for her to do there as the estate is practically in the middle of nowhere, there’s no children her age to play with and even the TV is broken. Mary tries to busy herself by helping around the house. First she tries to help the house keeper, Mrs Banks, but ends up nearly breaking a mug. She then turns her attention to helping the gardener, Mr Zebedee, but end up damaging one of his plants. In frustration she tries to sweep up fallen leaves in the garden but somehow ends up with a large bin of leaves on her head. A young boy called Peter, who is on an errand to deliver something from his mother to Charlotte, sees the mess she’s in and teases her by calling her a monkey due to her red hair, hair which Mary is really self-conscious of. Later as Mary is having a picnic, feeling really sorry for herself, a black cat comes up and befriends her. She follows the cat, which bizarrely seems to change from grey to black, down a dry stream bed which leads to an odd dry and dead looking part of the forest. There she discovers that there are two cats, not one which changes colours. The pair of cats lead her to a mysterious flowering plant which glows. Intrigued, she takes some of it's flowers home. Mr Zebedee identifies the flowers as fly-by-night bulbs which are incredibly rare in the region. He also explains to her that the two cats, Tib and Gib, are owned by Peter, which doesn’t impress her one little bit. Later than night, Tib comes to her window and she lets him in. He seems really scared by something and she lets him stay in her bed. But by the next morning the cat has disappeared. The following day Charlotte hands a note to Mary with an address and instructs her to go into town to deliver some jam to Peter which she reluctantly does. Peter tells her that Gib didn’t come home last night and has gone missing. The pair search for the cat in the forest. There she finds Tib and follows him in the hope of finding Gib. Mary refuses to heed Peter’s warning that the locals don’t head into the forest while it’s misty and continues to follow the black cat into a new part of the forest she has never been to. There she discovers a large tree with a intertwining root system and a broom caught up in it. She manages to free the broomstick and somehow accidentally bursts a fly-by-night bulb on to her hands. The sticky substance ends up on the broomstick handle which makes it come alive. It whisks both her and Gib away (with both of them riding it like a witch and her cat) into the air high above the clouds. As they are about to crash into a giant thunder cloud, the broomstick flies down into a strange land where an odd building can be seen sticking out of a misty valley. After a crash landing, Mary is met by a large anthropomorphic rodent called Flanagan. He mistakes her for a student at what Mary discovers is a magic academy called Endor College, a school for witches. As the first rule at the college is that trespassers get transformed into creatures, Mary decides to play along. She is greeted by the headmistress, Madame Mumblechook, who takes her on a tour of the college. Along the way Mary accidentally shows off her powers she has acquired from the fly-by-night bulb, which greatly impresses Madame Mumblechook and the chemistry teacher, Doctor Dee. However in Madame Mumblechook’s office she later admits that she got her powers from the fly-by-night bulb. After accidentally taking a master book of spells, Madame Mumblechook suspects she is hiding something. To appease her, Mary gives her the piece of paper with Peter’s address, telling her that is where her powers came from. Mary and Gib then manage to leave via the broomstick with Mary having no plans to return despite her belief that Madame Mumblechook thinks she will enroll in the school. However later that night Mary receives a magical message from Mumblechook informing her that she knows that she is a complete fraud and not a real witch and even worse she has kidnapped Peter. In exchange for letting Peter go, Mary must give her the rare fly-by-night bulbs she has in her possession. As I said before, this is the debut feature film for Studio Ponoc, a new animation studio made up mostly of former staff from Studio Ghibli in the wake of that studio’s decision to cease production on theatrical features. Heading up the studio is Yoshiaki Nishimura whom you may remember as the long suffering producer of Isao Takahata’s final film who made prominent appearances in the documentaries “The Kingdom of Dreams and Madness” and “Isao Takahata and His Tale of the Princess Kaguya”. Prior to this debut feature, the only other thing the studio has worked on was a TV commercial for Japan Rail West. The director of the film is Hiromasa Yonebayashi, who is most famous for his directorial debut with Studio Ghibli, “When Marnie Was There”, which like this film is an adaptation of a British children’s novel. 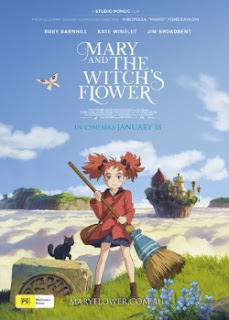 “Mary and the Witch's Flower”, is also based on a children's novel; Mary Stewart’s slightly obscure 1971 children’s fantasy novel “The Little Broomstick”. The late Lady Stewart was better known for “Merlin Trilogy” of novels and her romantic suspense novels. Her 1962 novel, perhaps her best known, “The Moon-Spinners”, was made into a live action feature by the Walt Disney Company in 1964. I do find it rather strange that this relatively forgotten author and her rather obscure children’s book (Lady Stewart only wrote three children’s books in her lifetime) was chosen by the studio as a basis for their debut feature. I suspect this has less to do with the studio and more a decision forced on them by the film’s production committee. Japan’s production committees (the group of companies ponying up the cash to make films) are full of notoriously conservative and risk adverse salarymen who wouldn’t know a good idea if it bit them on the arse. They are essentially why most modern live action films in Japanese cinemas are dull, inward looking local crowd-pleasers that never reach an international audience outside film festivals. Unfortunately I thought this film felt really derivative, like a pastiche of every Ghibli film of the last 15 years. Studio Ponoc seems to be trying to fill the void Studio Ghibli left with a knockoff feature film. I mean even the studio’s logo mimics Ghibli's to a large degree. All of the designs in the film really feel like rejected designs from a Ghibli production. The story is also riddled with problems. Being adapted from a British children's novel from the early 1970's, a lot of the early part of the story just felt out place as I think the film is meant to be set in the modern day English countryside. For example the markings on the moving boxes seem to indicate a modern era, but curiously we never see modern conveniences, like mobile phones and computers. Coupled with the rather old design of Peter’s bike and Chaolette’s old 1970’s era CRT television, it gives the impression that the film is set in a much earlier time period. Then you have some very Japanese traits which seem out of place in an English countryside setting, such as Mary wearing Japanese style slippers inside the house and the bento box wrapping on her lunch box. The status of Mary's parents is, as far as I'm aware, not mentioned in the film. Due to a line of dialogue about the mayor dying, I initially thought both her parents were dead. I also had difficulty with the story in terms of the journey Mary went on, from being unsure about herself and her appearance, to her the eventual acceptance of herself at the end of the film. It felt really ham-fisted, as did the development of the relationship (or lack thereof) between her and Peter. Not enough time was spent developing these two important ideas in the script. As a result I did feel distanced from both characters. Add in the fact Ghibli has previously produced two films based on children's or young adult's fantasy novels by British authors, and having been set partly in a fantastical school of magic, the whole film just really feels uninspired and like it's riding the coattails of other films. You just really have to question why Ponoc chose to adapt this book over an original work or adapting something else from a genre that hasn't been done to death. However once the film reaches the half way mark with Mary attempting rescue Peter from the clutches of Madame Mumblechook, there was enough interesting and well-staged action sequences to keep me entertained. But some of the action becomes a little too silly to take seriously, especially in some of the scenes involving an escaping group of animals who were transformed into strange creatures that Mary rescues. The message at end of the film also felt contradictory; Mary states that she doesn’t need magic to become who she is, however she’s just spent the majority of the film actually using magic to discover who she is and to feel comfortable with herself. Summing up, I had a lot of really mixed feelings about this film. I did like a lot of the film from the half way mark to the finale, but due to the designs and subject matter it's really hard to shake off the feeling that it's a Studio Ghibli knock off. It saddens me that the production committee, studio and distributors all probably wanted this and are most likely pleased with the result. Studio Ponoc should be aspiring to be better than this. This is a really disappointing and mediocre debut film for the studio. 5 out of 10.